Website presented by ©Carver Heights Quarterback Club™, Tallahassee, Florida. 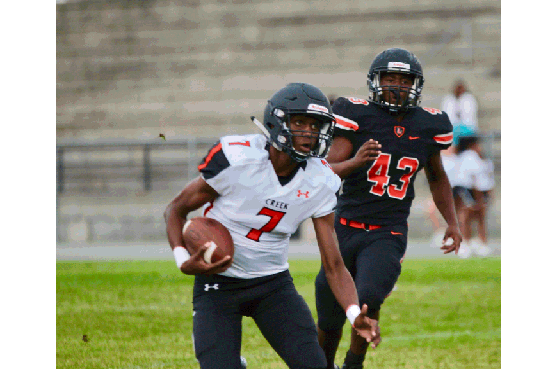 Spruce Creek Junior quarterback Jason McCoy runs with the ball against Leesburg. Updated: Thursday, July 5, 2018, 8:03 a.m.
minute delay set to transpire, the teams called the game with 4:04 left in the third quarter. Two of Scott’s first three carries resulted in touchdowns. froze a linebacker in the hole and raced 25 yards to the end zone on his next handoff. “I think it was a good way to set the tone for this year,” Scott said. “It’s been good (through the spring). Scott punctuated the Hawks’ third drive with a 5-yard score, following a pair of fourth-down pickups. to somebody else’s group,” Price said. Aaron Walton came away with an interception off a deflection, the lone takeaway for Spruce Creek. Zach Cummins, CJ Robinson and Oscar Mendez recorded a sack apiece. The defense also made a pair of fourth-down stops. Robinson chased down Leesburg quarterback A.
blew up a handoff to Jatavian Solomon, leading to a 5-yard loss on 4th-and-5. Division I offers. Price said Killins has missed all of camp with a groin pull. quarterback position is up for grabs. 36-yard score to Hayden Flood. picks came in the end zone immediately after an 18-yard run by Dallas Lovelace. opener against Seabreeze on Aug. 24.